Disassembly instructions. For qualified gunsmith only! Unload and disassemble the PS90 and secure the barreled receiver in a drill press. I used a #43 carbide bit and drilled out the blind pin. 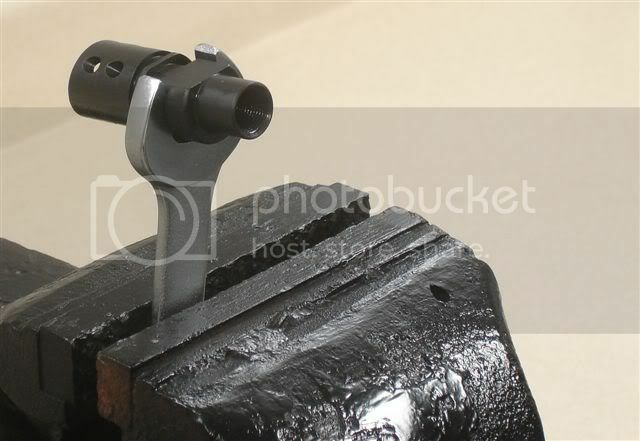 Using barrel blocks, clamp the barrel into a vise. You can then slip a 15mm wrench onto the chamber end of the barrel. A stardard size wrench will not fit, so you have to thin it down a bit in order for it to work. The barrel/flash hider is left hand thread, so turn the wrench clockwise to break it free. The barrel is now loose from the hider/sleeve and you can now slide it off. There are 3 springs used in conjunction with the barrel. 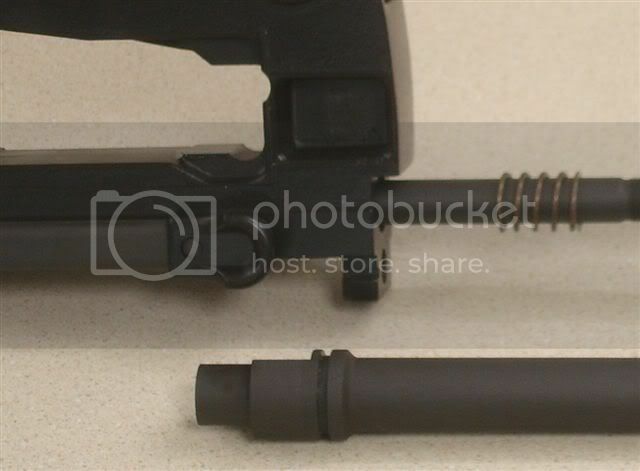 Here is the charging handle spring which is inside the receiver and is visible when you take your receiver off of the stock. There is a spring inbetween the sleeve and receiver (pictured below). And lastly, there is a spring and the takedown button near the chamber end of the weapon. 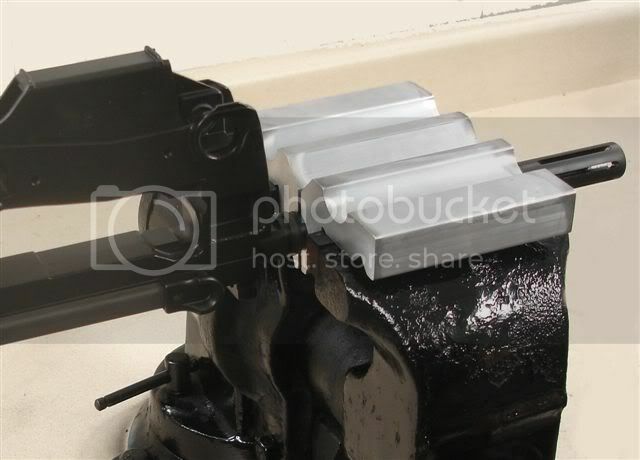 I didn't take pics of the handle or takedown spring as I didn't remove them for installation of the new barrel. 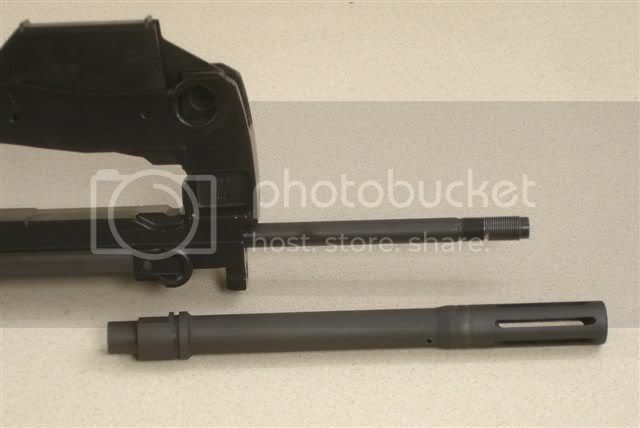 Instead of sliding my old barrel out of the rear of the receiver and having to mess with reinstalling the takedown and charging handle spring, I choose to to a dowel rod (or old PS90 barrel) to push the old barrel out (front to back). This keeps the springs captive. That way, when the new barrel is installed, you just push it in back to front and the springs are still there. Short barrel assembly instructions. For qualified gunsmith installation. All NFA rules apply! Place the flash hider in a 19mm wrench (wrench has to be thinned like the 15mm wrench mentioned above). 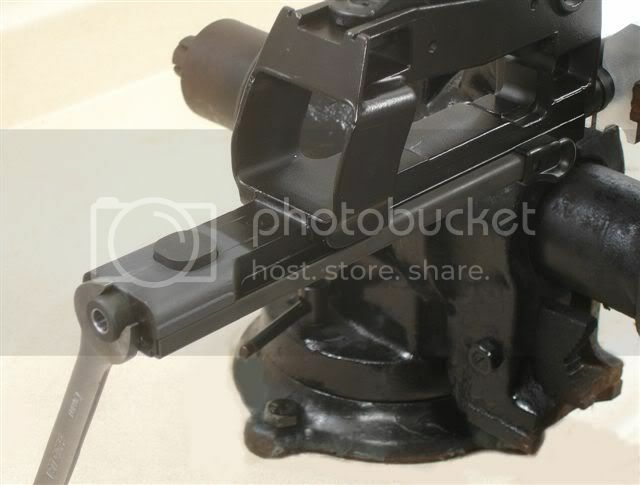 I position the wrench on the left side of the vise as pictured so when you install the barrel/hider counterclockwise (left hand thread), the wrench will bottom out on the vise shaft. Barrel is to be torqued to 30-35 inch/lbs. 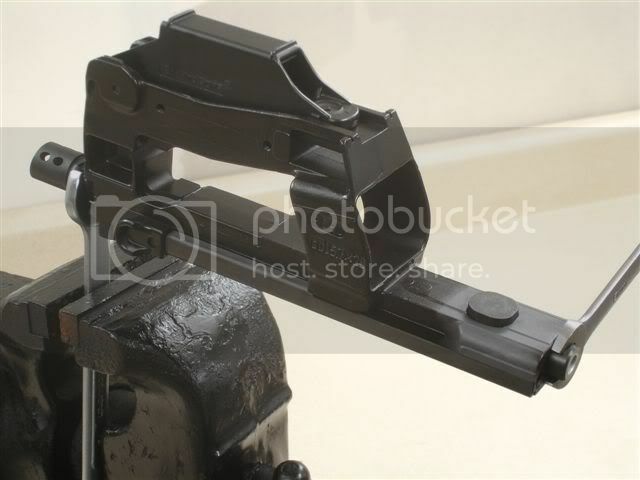 That should be enough detail for anyone to see how a barrel can be salvaged and a new barrel installed on the PS90/P90 weapon system. I've updated the WikiHow articles that are based on the information above. And if any one would like me to re-create the crow's foot torque calculation that I created and was sticky'ed on the old website, just let me know and I'll work on it over the weekend. That would be great if you could Hoover, thanks! jmz5 wrote: That would be great if you could Hoover, thanks! Great, I'll work on it over the weekend. 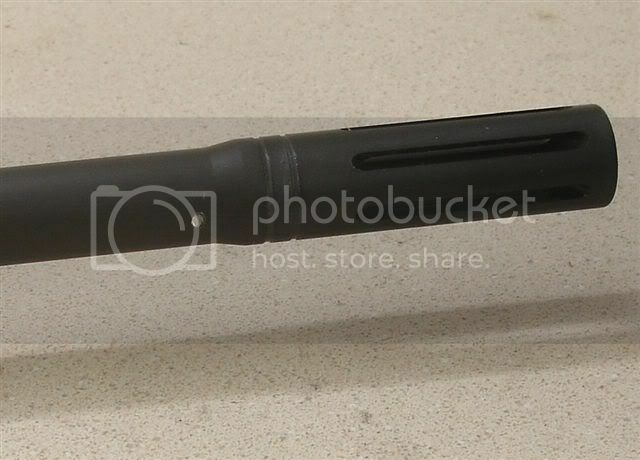 with keeping the original barrel can you change flash hiders on the long barrel? It's important to note that you have to drill a significant amount into the barrel shroud before you are actually through entirely down to the barrel. 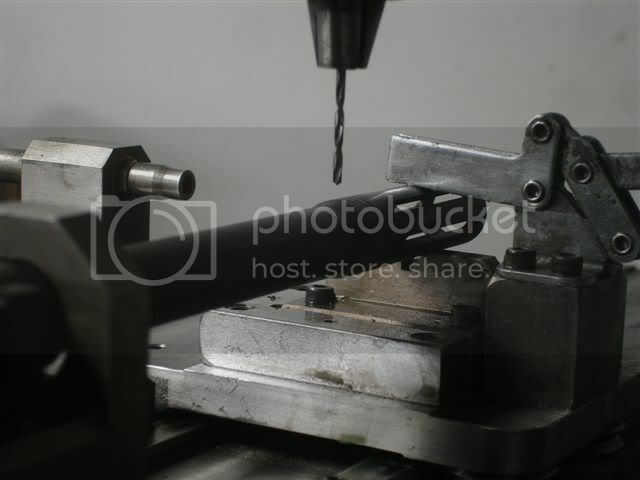 the image above of the drill hole is deceptively shallow. I thought i had gone deep enough but i didn't. Damaged some threads, but the barrel still screws on so nothing terrible lost. Just a heads up for the other "do-it-yourselfers" out there. I just don't see why you HAVE to buy an expensive short barrel if you are a machinist and have access to a lathe (like me). I have shortened/rethreaded/re gasported so many AR barrels - am I just missing something? i've heard its because the barrels are chromed and they have the potential to flake. I found this website that claims otherwise http://www.trosusa.com/PS90/ps90sbr.htm" onclick="window.open(this.href);return false; its some business or something that does it for people. Keep in mind that this is deceptively difficult, I have talked to many machinist's and I myself had a VERY difficult time with this. Mine ended up having to be chopped off with a hack-saw. If you can do it, big time kudos! Well I am new here but thought I should ask where did you get and what did the short barrel kit cost? I cut mine off with a band saw. Bought a new 1/9 barrel and flash hider from CMMG. Any gunsmiths doing this regurarly? This is beyond my skills. 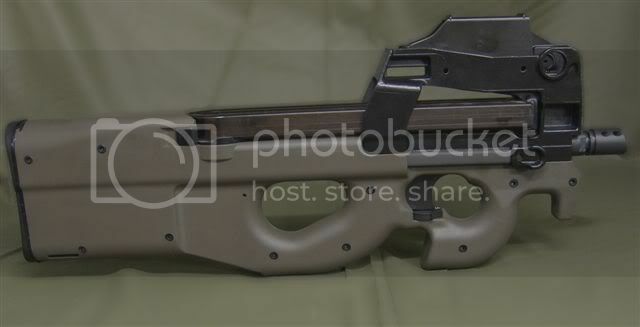 I need this doing as well guys, any good gunsmiths around? Around is a relative term, where are you located? I know one that does a lot of PS90 work. He's also pretty heavy which makes him a round gunsmith. Coincidentally, he's around me in Jacksonville. "If you can dream it....you can do it."